Important for Locky Ransomware victims! Files, encrypted by Locky Ransomware could not be the only harm done to your computer. Locky Ransomware may still be active on your machine and may spread to other computers on your network. To detect if you are still at risk and eliminate the threat, we recommend downloading SpyHunter. 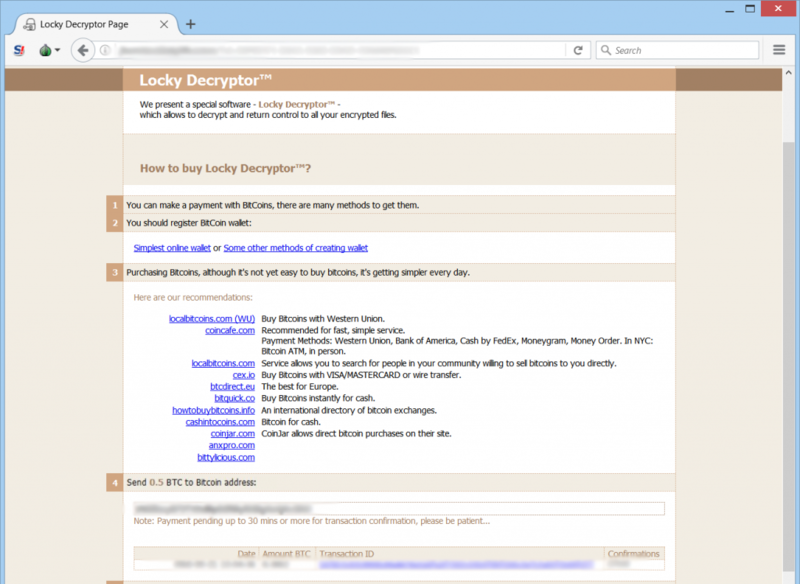 Yet another version of the notorious Locky has been released. It is most likely an updated variant of the .aesir file extension Locky, similar to what Cerber ransomware, the other big player in this segment does, coming up with multiple variants in short timeframes. This variant of locky uses a .js file for the infection, but it does not have it’s own command servers and is instead automated, researchers believe. In order to understand how to remove this virus and learn alternative methods to try and restore your files without having to pay the ransom, we advise you to read this article thoroughly. Both sites aim to lead the victim whose files are encrypted by Locky’s .zzzzz variant to the traditional for this family of malware Locky Decryptor web page. What Is Locky’s Encryption and Why I Cannot Open My Files? Files that have been encrypted will have the file extension with the repeaded “z” letter and become no longer openable. The encryption believed to be used for those files is AES-128 in combination with a cipher that is RSA-2048 and produces a unique decryption key for each infection. After this is done, Locky ransomware may delete backups and other file history using the vssadmin command. How Did I Get Infected With Locky .zzzzz? In order to fully erase the virus we advise you to use an advanced anti-malware program in case you lack experience in malware removal. It will professionally delete all objects associated with Locky on your computer in a swift manner. Those methods may not be 100% effective but they may be effective enough to restore at least some of your files.